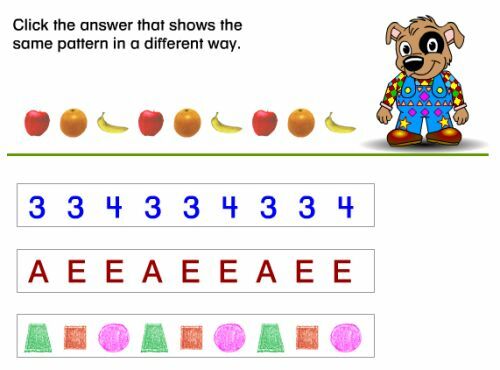 Paul Pattern the playful dog needs your help to work out the right answer to questions about patterns. On each question, he will ask you to click the answer that shows the same pattern in a different way. That pattern might be numbers, it might be shapes, or colors, or even types of animals. You need to spot how the pattern resembles another way of representing that sequence, then choose your answer. Asking kids to understand how patterns work, this goes beyond numbers and is useful for first and second graders. Get enough questions right, and Paul will reward you by taking to the dancefloor in a groovy disco!